Today’s story is from Genesis 25:19-34 and Genesis 27. As Isaac grew up, he got married to a woman named Rebekah and they had two boys, Esau and Jacob. God told Isaac and Rebekah that the older boy would serve the younger boy. The babies were born at the same time, but Esau came out first and then Jacob. That made Esau the oldest. If you remember from the story of Cain and Abel, the oldest boy was supposed to get all the honor and all the land, and money and STUFF when the daddy died. He would be in charge and be the most important. He would also get a special blessing from his father…his dad would ask God for special things for him. As the two boys grew up, they were very different. Esau (the big brother) was very manly and covered in hair. He liked to hunt animals and work outside. Jacob, was very smooth, shiny, clean and he like to be inside. One day, after hunting, Esau came home and he was SUUUUPER hungry. Jacob had just made some stew (like soup). Esau was not patient and he didn’t appreciate what a big honor it was to be the biggest. So he BEGGED Jacob for some stew. Jacob was kinda sneaky and he said, “ok…you can have some stew…if i can have your birthright (the land and stuff and to be in charge. )” And you know what? Esau said ok!? That’s like giving up ALL your toys for one piece of candy. Later, when Isaac was very old and about to die, he called Esau into his tent and asked for some food so he could give him the extra special blessing. But Isaac couldn’t see very well. The mommy, Rebekah, remembered that God had said the younger brother would be blessed, so she told Jacob that HE should sneak in and get the blessing. Esau went out to hunt some food, but Jacob got some goats and the mommy cooked them. Then Jacob put some animal fur on his arms so he would feel and smell like Esau. Then he went to see his daddy Isaac and it worked. It tricked Isaac and he gave Jacob his blessing. He prayed to God and asked that Jacob would always have lots of land and food and that all the other people would bow down and serve him. Just then, Esau came in and asked for his blessing, but it was too late. And he was MAD. He wanted to kill Jacob! (like Cain had done when his blessing was given to Abel). So Rebekah told Jacob how mad Esau was and told him to RUN away and he did, he hid for a long time. Once again, God chose not the most important person, but the “lesser” person. God has chosen us too! Even though we are “lesser” and don’t deserve God’s love…He loves us anyway. And He chose to give His son, Jesus for us. God had always meant for Jesus to be one of Jacob’s descendants, but Jacob got there by being sneaky and because he did it his own way, he had to run away and hide for a LONG time. When we trust in God, He will lead us where we should go. God loves you has big plans for you and you can trust that He knows what is best. 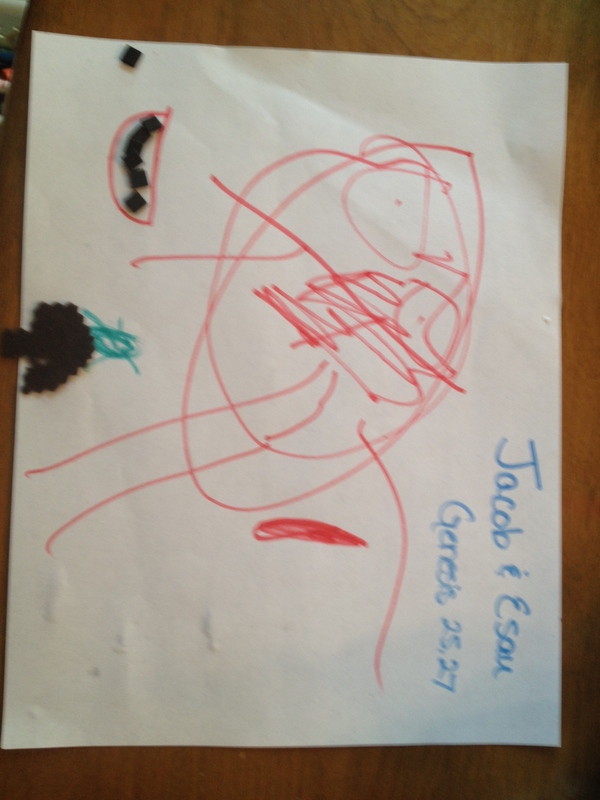 For our craft, we drew red, hairy Esau and a smaller, smooth Jacob. 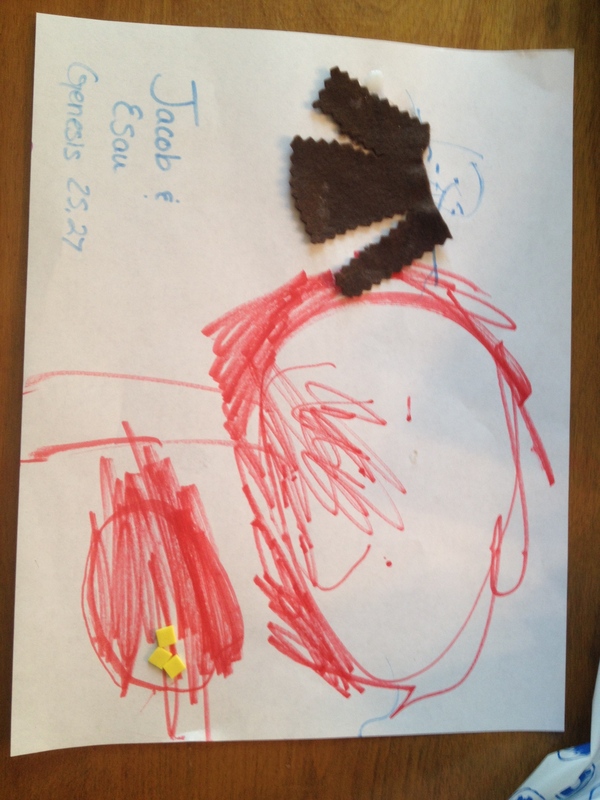 We drew Esau drinking the stew and Jacob covered in animal fur. We also found this video posted by Crossroads Kids’ Club.